Abstract: In this paper, we present detailed field observations, chronological, geochemical and Sr–Nd isotopic data and discuss the petrogenetic aspects of two types of mafic dykes, of alkaline to subalkaline nature. The alkaline mafic dykes exhibit a cumulate to foliated texture and strike NW–SE, parallel to the main trend of the region. The 40Ar/39Ar amphibole age of 321.32 ± 0.55 Ma from an alkaline mafic dyke is interpreted as an indication of Carboniferous cooling through ca. 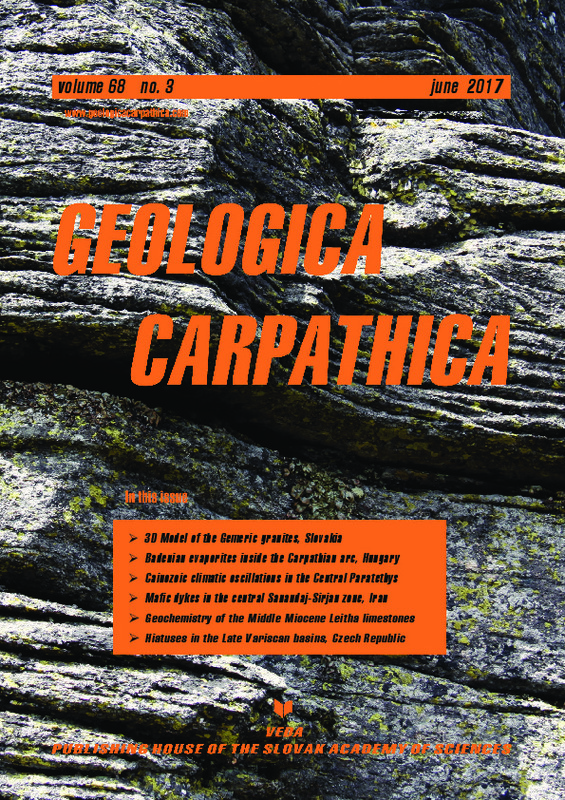 550 °C after intrusion of the dyke into the granitic Galeh-Doz orthogneiss and Amphibolite-Metagabbro units, the latter with Early Carboniferous amphibolite facies grade metamorphism and containing the Dare-Hedavand metagabbro with a similar Carboniferous age. The alkaline and subalkaline mafic dykes can be geochemically categorized into those with light REE-enriched patterns [(La/Yb)N = 8.32– 9.28] and others with a rather flat REE pattern [(La/Yb)N = 1.16] and with a negative Nb anomaly. Together, the mafic dykes show oceanic island basalt to MORB geochemical signature, respectively. This is consistent, as well, with the (Tb/Yb)PM ratios. The alkaline mafic dykes were formed within an enriched mantle source at depths of ˃ 90 km, generating a suite of alkaline basalts. In comparison, the subalkaline mafic dykes were formed within more depleted mantle source at depths of ˂ 90 km. The subalkaline mafic dyke is characterized by 87Sr/86Sr ratio of 0.706 and positive ɛNd(t) value of + 0.77, whereas 87Sr/86Sr ratio of 0.708 and ɛNd(t) value of + 1.65 of the alkaline mafic dyke, consistent with the derivation from an enriched mantle source. There is no evidence that the mafic dykes were affected by significant crustal contamination during emplacement. Because of the similar age, the generation of magmas of alkaline mafic dykes and of the Dare-Hedavand metagabbro are assumed to reflect the same process of lithospheric or asthenospheric melting. Carboniferous back-arc rifting is the likely geodynamic setting of mafic dyke generation and emplacement. In contrast, the subalkaline mafic sill is likely related to the emplacement of the Jurassic Darijune gabbro.